Over the course of ten years I worked my way up in the TV industry, from the very bottom starting as a runner to the top, producing and directing factual entertainment shows, more commonly known as reality TV. During those years I gained an in depth understanding of human behaviour and how its possible to influence people's emotional responses without them fully noticing. I worked on well known TV shows such as Come Dine With Me, Secret Millionaire and a whole bunch of property, food, makeover and celebrity TV formats that gained viewing figures in their millions due to very carefully crafted producing, perfect casting and subtle directing. Each show I worked on gave me unique insight on how to gain an intimate knowledge of an individual's life so it can be edited and repackage into a highly entertaining bite size video/film, which ironically was as far away from 'reality' as could possibly be. An edit producer friend of mine once said, ‘reality is incredibly boring’! Our job is to convince viewers that real life can be as entertaining as a great film'. No matter what I produced and directed I had to turn these real life elements into a hilarious romantic comedy or a uplifting, tear jerking drama. I wrote reality TV scripts that relied heavily on forecasting peoples behaviours to encourage more story development between them all, influencing jeopardy so the viewers become more invested in the characters and taken on a journey with each scene I film. As I began a new career in online marketing I discovered that all my experience producing and directing popular TV shows proved hugely useful for launching people, business and brands online. The path to success was no longer unpredictable and comprehensive enough to be communicated in something as simple as an infographic. It was possible to accelerate the success and growth of a brand (whether it’s a business, individual or product) with the combined use of one reality TV appearance and the strategic use of all the top social media platforms. An appearance on a popular TV show can be the perfect launch pad for popularising yourself or brand. Social media can then be used to continue building and engaging with your audience. Writing and posting a consistent on-ongoing blog can be your platform for making sure you are linking with popular trending content, helping your blog to rank on the first page of a Google search so you continue to maximise your audience. 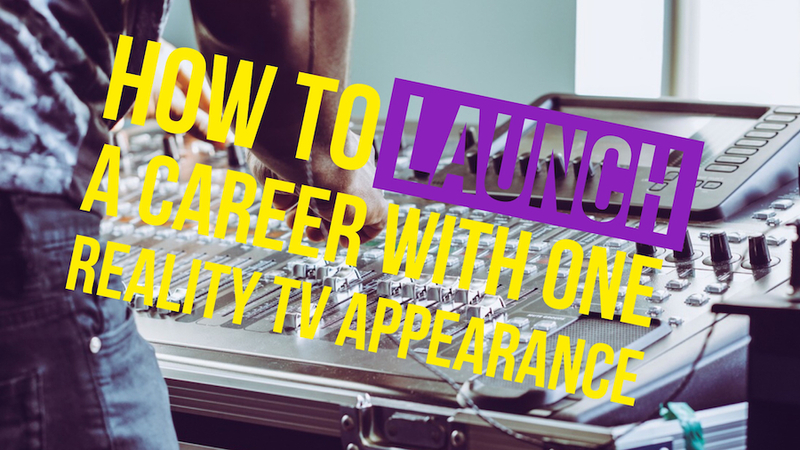 You can find out how the reality TV industry works and how you can ace your way through every stage of casting for a reality TV show by reading this industry insiders guide How To Get On A Reality TV Show. Just before you are due to appear on a TV show you will want to have your entire online profile up-to-date and in full working order. If everything is perfect before going through the TV casting process you may get rejected for being to media savvy. Reality TV producers prefer seeing you warts and all and a perfect online profile, especially one that's trying to sell or promote something is going to put them off. A bit of disorder shows character, one of the essential ingredients for a reality TV star. As soon as your position is secure on the show you can then begin working on optimising all your social media, websites anything online that presents anything about you. Update information, edit what you want and don't want the world to know about you. Make sure your brand, business, skill or whatever it is you wish to build an audience for is correct and ready to receive a lot of traffic. You will want to have an account with all the top social media platforms, Google, Facebook, Twitter, Instagram, Snapchat, Pinterest, Tumblr, Youtube, Vimeo, etc. Make sure your branding and username is consistent as possible across all the different social media platforms to avoid any confusion. Maintaining consistent graphics and text is how big companies make sure their audiences differentiate them from their competitors and a simple way to build confidence in who they are and you will be wise to do the same. By the time your TV appearance is broadcast you will be 100% online ready so your new audience has no trouble finding you online and discovering more interesting things about you. You can even do something as the show broadcasts for the first time that has the potential to be hugely effective. Most TV shows will have a little hashtag text graphic appear at the beginning of a TV show so the audience can use twitter to tweet their thoughts, opinions and comments to one another using the programs hashtag. This can be a bit of a minefield for sensitive or impulsive people but if you can filter your responses and think before you tweet you can have some fun interacting with the blunt comments and observations of your brand new audience. If you play it smart you could gain a lot from this live audience engagement but if you feel yourself being provoked by a persistent troll type its highly advisable for you to exit and not risk messaging a highly regrettable emotionally charged response that a tabloid newspaper could have a field day with. This advice goes for everything you do after becoming someone who is now in the public eye. The more well known you are the more your actions become an interest to people. You now need to think a lot more about how your actions could be misunderstood. Promoting your brand, talent or idea should be done thoughtfully and creatively. The more people feel like they are being advertised or sold something the less interested they will be. If you share something that has something personal or emotional at its essants your audience is far more likely to engage with it. Think about how you can promote something in a way that helps your audience to emotionally connect to you, then make it as visually aesthetic as you can. Video is ten times more effective than just text alone so think about adding clips from your TV show to your Youtube channel and try to add some screen grabs or GIF's to your other social media platforms. Be consistent with the times you choose to engage with your social media audiences. Regular posts will get you far better results for a Google ranking.